Start again with a clean slate. Lean on others for support. Start again with a clean slate. Lean on others for support. This card usually shows up at the start of something new: a new phase of life, a new job or major promotion, a voyage to somewhere you’ve never been before. The guidance is to let yourself be like the baby—open, curious, and excited! Allow yourself to be “parented” in one of its many forms: find a mentor, take extra training, seek guidance, or simply let others assist your navigation of this new circumstance or situation. Invite and welcome those individuals who can show you the ropes and watch over you as you find your footing. Sometimes the card appears after we’ve done a tremendous amount of spiritual work. This inner work can be meditation, therapy, or other studies related to self-realization and self-actualization. 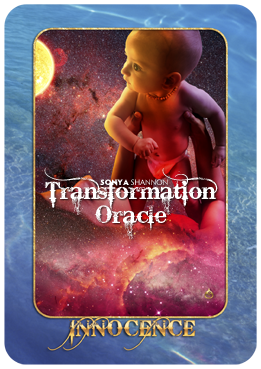 When the INNOCENCE card appears, it means we have achieved a spiritual wisdom that lets us experience life as though for the very first time. It’s an acknowledgement that we are now living each present moment as it comes, no longer distracting ourselves with rumination over the past or projection into the future. We can simply breathe and BE. If this card appears upside-down, something is blocking you from getting help in order to start your new situation. Common culprits are a fear of not looking good/fear of vulnerability, excessive pride, and anger, resistance, or overwhelm about learning something new. To see how to overcome these challenges, look at the other cards in your spread or pull a new card.